My take on what's happening in the mobile apps space and how to benefit from best practices. In this roundtable, participants will discover why widgets will be much bigger in mobile than the PC/web and learn about the new, global mobile widget standard that has these “mini-apps” poised for rapid growth on the heels of mass compatibility. On June 16, the Mobile Visionary Roundtable at the Illinois Technology Association (ITA) welcomes virtual guest speaker Mark Caron presenting, “The Coming Global Wave of Mobile Widgets.” Mr. Caron, based in New York City, is the Founder and CEO of Snac, Inc. He has spent his career playing a leading role in bringing mobile services to the mass-market; starting with digital wireless services in the 1990s, text messaging in the early 2000s, and now the mobile internet with his latest start-up, Snac, Inc.
Roundtable presenters will address major factors impacting the mobile industry and highlight success stories. Following the insightful mobile industry presentation, participants will benefit from networking opportunities to share best practices in mobile marketing, technology and application development. This event takes place in downtown Chicago on Wednesday, June 16, 2010, 8:30am-10:30am. ITA roundtables are a benefit of ITA membership. Members of the general Illinois technology community are always welcome to check out any ITA roundtables free-of-charge. Roundtable events are held in downtown Chicago, across from the Sears Tower (now named the Willis Tower) at 200 S Wacker Dr, 15th Floor, Chicago, IL 60606. Mark Caron has spent his career playing a leading role in bringing mobile services to the mass-market; starting with digital wireless services in the 1990s, text messaging in the early 2000s, and now the mobile internet with his latest start-up, Snac, Inc. Prior to founding Snac, Mark was Founder/CEO of MobileSpring/Ztango (now part of Real Networks). Under his leadership, the company developed and deployed in 2001, the first inter-carrier text messaging network, enabling messages to travel cross-network and kicking off the explosion in text messaging. After merging with Ztango, Mark as CEO led the company in offering a range of messaging and mobile content services to nearly all tier 1 and tier 2 US carriers. Before MobileSpring/Ztango, Mark was a co-founder and lead marketing executive at Omnipoint Communications, the first GSM carrier in the Northeast (now part of T-Mobile). Mark started his wireless career at Ericsson as a Product Manager, after working in information systems and telecommunications at GE. He has an AB in Computer Science from Dartmouth College and an MBA from Harvard Business School. The Mobile Visionary Roundtable offers a forum for ITA members to engage in active networking and interactive, high-gain, topical discussions regarding mobile marketing and technology. The monthly Mobile Visionary Roundtables feature mobile expert guest speakers, including mobile strategists, marketers and developers from around the world. Tim Cascio is the author of the Mobile Marketing, Monetization and Methods blog, Co-Founder/Co-Chair of the Mobile Visionary Roundtable at the Illinois Technology Association and Sr. Digital Strategist at Bader Rutter & Associates, an award-winning integrated marketing services agency that specializes in advertising, public relations, brand asset management, relationship marketing and digital solutions. Tim is @timcascio on Twitter and can be reached in the United States at 262-938-5543. Please reach out to me if there’s any way I can help you through my network or otherwise. Your comments below are welcome. Augmented realty supplements what you see in real life with animation, data and other digital information. Sensors and actuators that leverage GPS technology and video on mobile devices can create some stunning applications. By viewing through the display of your video/GPS enabled phone, insightful information about people, places and things that surround you can be revealed. Layar’s augmented reality example demonstrates how real estate listings in the Amsterdam area can be viewed and further filtered to show only those that interest the user. Additionally, properties at a distance and out of line-of-sight are indicated and can be brought to the foreground. Layar is venturing into the 3D space as well with their Layer 3D; a public launch planned for November 2009. The folks at HitLab, located in New Zealand, are doing some groundbreaking research in augmented reality for commercial applications, including advertising. When the phone’s camera encounters a special symbol or shape in a newspaper ad, for example, it displays a custom 3D image that changes perspective as you move about. Another related use brings to life athletes on trading cards. Topps has a good head start with their offering (not yet available on mobile). Bionic Eye was released September 22, 2009, and Mashable did a nice writeup on their app. Geolocation or geotagging of digital assets will generate even more possibilities and interest in augmented reality. Content such as videos, photos, podcasts, and news stories can be tagged with latitude, longitude and altitude location data. Geotagging of photos is an automated service offered by Eye-Fi. And, you can use your existing digital camera and Eye-Fi’s wireless SD card. Practical uses of augmented reality range from surgical procedures (using augmented reality headsets) to a new category of gaming called pervasive gaming. Terrific ideas are emerging from nearly every industry. What does the future hold? I expect augmented reality to eventually include convenient, fashionable eyewear that communicates with your mobile device, leaving you hands-free to enjoy the experience to a greater extent. Taking a photo snapshot to recognize a person, place or thing (an attractive flower, for example) will provide access to more information and/or where products are sold. Pasi Niemi drew my attention to what Nokia’s developing in this regard – click here. (Thanks, Pasi!) Imagine the prospects as content mashups begin to include Amazon, Flickr, Facebook, Twitter, LinkedIn, CraigsList, Yelp, Wikipedia and localized search. Mobile Monetization: Is a Mobile App Right for Your Business? Reflections on why mobile app growth is so explosive, how to benefit financially and what to consider before diving in. “There’s an app for that!” is a catch phrase that has become familiar to us, thanks to the marketing geniuses behind Apple’s iPhone television commercials. By definition, an app is a mobile software application that is downloaded to a smartphone. Downloads to the smartphone don’t require a computer connection. Users can download on-the-go and within seconds have an app installed. The user can then launch the app with the click of a button or a tap on the screen. What are the primary factors contributing to the explosive growth of mobile apps? Increased smartphone capabilities. Built-in smartphone capabilities are empowering apps to perform an ever-increasing number of functions. Features include high definition video playback and VGA video capture, touch screen, gravity-sensitive accelerator, personal GPS navigation, portable multi-player gaming, mobile TV and radio streams, app commerce, push notifications and the ability to control other devices. For the first time, with the right combination of installed apps, mobile devices are a legitimate alternative to toting a laptop. Reasonably priced smartphones and apps. The 8GB iPhone was initially priced at $599 in 2007. Today, an even more capable iPhone 3G is priced at $99. Verizon recently offered a BlackBerry buy-one-get-one-free promotion, including its touchscreen-endowed Storm. Apps, too, are either free or very affordable, typically ranging from $0.99 to $9.99. Reach and monetization. Remember when you were a child and pondered, “What if I received just a dollar, but from a million people?” Mobile provides global reach. And Apple’s not the only game in town – Blackberry, Nokia, Android and Palm devices all have their own app stores, with Microsoft’s entry on its way. Besides the sale of an app itself, there are additional revenue generating opportunities. Proprietary content can be sold on a subscription basis, including magazines, movies and audiobooks. In-app advertising is becoming more prevalent. Retailers are already selling securely through mobile apps. The e-learning industry has subscription and certification options to monetize their investments. Gamers are selling additional access levels and digital content within their apps. Charitable organizations, including churches, will soon accept donations. Dating sites will likely up-charge for location-based, peer-to-peer matchmaking features. The revenue potential is wide open. Creativity. There’s no shortage of creative minds at work today, looking to leverage existing investments in technology and proprietary content. The opportunity to create potentially revolutionary apps attracts innovators. The sheer number of downloads – over 1 billion for Apple alone – is proof positive that this marketing channel is viable and sustainable. A spot-on app requires a close examination of how best to serve target audiences with what matters to them, wherever they are. •	What are our goals for developing an app? •	What device platforms are most familiar to our target audience(s)? •	What features must be included in version 1.0? •	How can we best leverage our investment in existing content and technology? •	What problem can mobile technology solve for our target audience(s)? •	Which apps available today compete with our idea and what is our plan to differentiate? •	Is our app buzz-worthy? Keep in mind: mobile apps require their own marketing and product development strategy to ensure long-term success. Make plans to support your app through continued improvements and new features to maintain your competitive edge. Monitor your app’s review feedback and act upon insightful new feature requests to keep customers coming back and to lure new ones into the fold. Think about all your marketing efforts and customer touch points, and develop a plan to promote your app across each one. Choosing the right developer for your app is essential to prevent unnecessary re-work. Your mobile strategy team should include experts in mobile application development and promotion. Despite the phenomenal number of available apps, businesses still have a window of opportunity to establish themselves early within the mobile marketplace and to gain share. Websites were once seen as an obscure marketing tool but have now evolved into a marketing essential in assisting businesses to establish and maintain relationships with their target audiences. Once every ten years or so, a new marketing tool changes the way we do business. Where can mobile apps take your business? Author Tim CascioPosted on June 24, 2009 May 1, 2010 Categories mobile appsTags app monetization, apps development, apps monetization, iphone app, iphone apps development, iphone developer, iphone development, mobile apps, mobile marketing, mobile monetization, mobile phone appsLeave a comment on Mobile Monetization: Is a Mobile App Right for Your Business? What does the future hold for smartphone mobile apps? Smartphones have become lifestyle tools. The perfect marriage of entertainment and utility. I find myself leaving my laptop behind for greater spans of time as I head out to business meetings and functions with only my iPhone. As more capability is added to smartphones in terms of storage, bandwidth, built-in functionality and now third party apps, it seems that we are limited only by our imagination. With over 35,000 apps in the iPhone App Store and over 1 billion downloads, Apple’s doing a great job of whetting everyone’s appetite with their marketing efforts and out-of-the-gate success. There’s strong consumer migration towards web-capable handsets. We see about 90% of the smartphone content on Blackberry and iPhone platforms. Blackberry and Android recently opened their apps stores and Nokia’s slated for a summer launch of their Ovi Store. To date, the Blackberry and Android stores are significantly underserved in terms of quality apps/content providers. Blackberry’s user base is considerable, at nearly 50% of the smartphone market, so we anticipate a lot of developer participation in that space. Android’s open source appeal will draw developer interest as well, but the pace will correlate with the available handsets that use the Android platform. Currently, in the US, only T-Mobile’s G1 uses Android. As companies benefit from the monetization of their apps, word will spread about their success stories. There’s a handset war going on providing increasingly attractive price points for consumers migrating to smartphones. Apple’s likely to announce a new handset at a lower price point ($99 is the word on the street) and their launch of OS 3.0 this summer will include over 100 new features. Perhaps the most important game-changer is the forthcoming In-App purchase capability. This opens the door for visually rich online catalog storefronts for companies of all sizes. Advertising supported content will become a common revenue model for apps. You’ve probably already noticed the growing number of creative interactive ads. Sophisticated targeting capabilities and low-cost customer acquisition is attracting advertisers. Mobile apps analytics dashboards, complete with graphics, provide information about how your users are interacting with your application, how much time are they spending and reveals your audience likes and dislikes. Businesses can track the success of their mobile goals and ensure a measurable return on investment. Companies that truly understand their audience segments, define a mobile strategy, execute well and act upon analytics results are in the best position to capitalize on the benefits and explosive growth of smartphone apps. Stay tuned; we’re in for a wild ride! Author Tim CascioPosted on May 8, 2009 May 1, 2010 Categories mobile appsTags apps development, blackberry apps, iphone apps, iphone apps development, iphone developer, iphone development, mobile apps, mobile phone apps, smartphone apps3 Comments on What does the future hold for smartphone mobile apps? Views expressed here are mine alone. Bader Rutter & Associates, Inc. 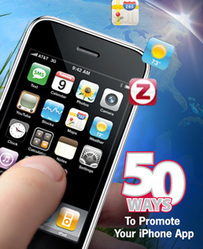 Mobile Marketing, Monetization and Methods Blog at WordPress.com.